Alcorcon players did not try to score when Reus Deportiu protested over unpaid wages in the first minute of a Spanish second-tier match on Sunday. Reus' players, who have reportedly not been paid for three months, gathered in a huddle after kick-off at Estadio Municipal de Santo Domingo for the LaLiga 123 game. Despite being given the chance to score against passive opponents, Alcorcon instead opted to keep the ball in their own half until the demonstration came to an end. Their show of sporting support has been praised but Alcorcon, chasing promotion to the top division, went down to a 1-0 defeat. A first-half penalty from Luis Gustavo Ledes, scored after Carlos Bellvis handled the ball in the area, earned struggling Reus a vital three points. 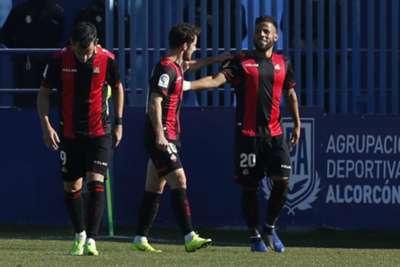 They move out up to 19th place after breaking a run of four straight losses in league action, while Alcorcon missed the chance leapfrog Granada and take over top spot.